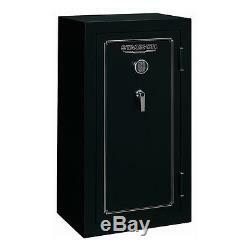 Stack-On FS-24-MB-E Fire Resistant 24-Gun Safe with Electronic Lock. The Stack-On 24 Gun fire rated safe with electronic lock (matte black) is fire resistant up to 1400 degrees for 30 minutes to protect important papers and other valuables and has a fully convertible interior that can convert from all guns to all shelves. The exterior has a matte black finish with chrome accents. Ships only within the continental United States. Replacements only for damaged goods. Proof of damage MUST be provided. Item: Fire Resistant 24-Gun Safe with Electronic Lock. This is a California-approved Firearm Safety Device that meets the requirements of Penal Code section 23655 and the regulations issued thereunder. Electronic lock includes a drill resistant, hardened steel plate behind the lock for greater security. A backup key is included. Batteries are accessible from the front of the safe and are easy to replace. Tested and verified to be fire resistant for 30 minutes up to 1400° F by ETL an independent testing lab. 2-Way locking with 3 - 1 steel live action locking bolts and 2 dead bolts for 5 locking points. 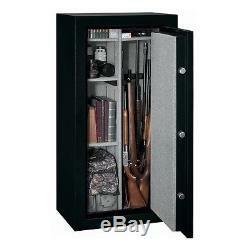 Safe holds 24 rifles or shotguns or 12 firearms and storage or all storage. 4 Adjustable shelves and fully carpeted interior included. Not recommended for storing CD's or other electronic storage devices. Fastening hardware is included with each safe. Exterior Dimensions: 29-1/4" W (74.3cm), 20" D (51.6cm), 55 H (140cm). Interior Dimensions: 26.89" W, 14.47" D, 52.72 H. Interior Cubic Feet: 11.95 (20655 Cubic Inches). Interior Capacity: 24 guns / 12 guns and storage / all storage. Locking Points: 5 (3-1 Live Action Bolts, 2-Steel Dead Bolts). Master Carton Dimensions: 30-1/2" W, 23-1/4" D, 56 H.
Color: Black matte paint finish with chrome accents. _gsrx_vers_827 GS 7.0.13 (827). The item "Stack-On FS-24-MB-E Fire Resistant 24-Gun Safe with Electronic Lock" is in sale since Thursday, August 25, 2016. This item is in the category "Sporting Goods\Hunting\Gun Storage\Cabinets & Safes". The seller is "homeorganization" and is located in Wauconda, Illinois.